Phil Brecker leaned over the lunch room table, rolled up his sleeves as far as they could go until they bunched against his chubby upper arms and the tight fabric of the worn down button up. He was self-conscious of this. The last year, for him, had been marked by a decline in his metabolism. He was packing about 23 pounds extra, and in a recent checkup, was informed his blood pressure was too high, 146/92. He was told if it didn’t come down by his next checkup in 3 months, he would be given a prescription for an ACE inhibitor, and as a 36 year old man, he didn’t yet want to be dependent on pills. He couldn’t even remember to take a multivitamin daily. The thought of medication expanding his blood vessels made him queasy, frightened him, so he was on a mission to expand the walls of his blood vessels naturally, without the haunt of knowing he was ingesting a flat, round thing with a sterile, chemical name. That would be avoided. While riding the elevator up one morning at work, a little TV screen that scrolled news and fun facts flashed a report of a recent study showing that people who ate 1.5 ounces of pistachios each day did not tend to see a rise in blood pressure when faced with stress. Phil often felt stressed in his research job. He always felt like he had bottomless piles of paper to get through, found himself in endless trails of new tabs open, linked from other web pages he had open as he researched the validity of the information assigned to him. He squeezed in some time to research the validity of the pistachio study, to appease his own interest. He went on to read articles about it in The New York Times, The Pittsburgh Post-Gazette, The Wall Street Journal, CBS News, and JAMA Internal Medicine. He felt more comfortable with this as an option to lowering his blood pressure. He’d never had pistachios in his 36 years of living, but on a few occasions, he’d had pistachio ice cream, and he had liked it each time. So his new snack food was pistachios. He’d take a break in the afternoon and carry a black plastic bag, the likes of which are usually issued with liquor store purchases, from his desk to the break room. He’d set the bag on a table in the corner, remove a big bag of pistachios, as well as a small scale. He’d proceed to load the scale’s platform with shells until it reached 1.5 ounces. Sometimes he’d have to remove a few shells to get it down to the desired serving size. He’d do this while ignoring curious glances at his small appliance on the table top. He successfully stuck to snacking on pistachios daily, despite his fear of having to take a pill daily, Despite a fear of not remembering to do it, but the way he saw it, he snacked daily anyway. Pistachios were better than chips, let alone pills. It also satiated his appetite better than an afternoon bag of chips, and he felt less ravenous for pasta when he got home from work. After a few weeks of this, he felt like he even lost a few pounds. He even stopped using the scale to measure his snack, he could now spot check his fistful, and if it was over 1.5 ounces, well, that was just more of whatever it was in pistachios that lowered blood pressure. He decided he loved pistachios, looked forward to that 15 minutes in the afternoon when he could rip into the catharsis of cracking open shells, piling up the pried open discards on a napkin. Carrying the done heap that rested on the brown paper cloth like they were tiny bodies on a stretcher, to the trash can, made him feel victorious. He felt like he was changing his life. It only took a few weeks until everything he felt about this ritual, changed. It started with his first cracking of a pistachio shell during his break. He’d just trimmed his fingernails the night before, and these shells had a tighter gap. He didn’t quite have long enough tools on his fingertips to get the right leverage. So he really had to dig in there. A good many of the shells couldn’t be opened. A little while after his break, he was back at his desk, typing, and he realized his thumbs were sore, right beneath the nail. In examining his fingernails, he could see a speck of a blood blister inside the pale translucence of the nail, which must have been caused by the pressure of really digging into those goddamn tight pistachios. He had always been uncomfortable with the sight of blood, even a small flesh wound. The soreness was also a distraction while he tried to type. Then he wondered about possible infection, if dirt might have been driven into the space between nail and hidden skin, and if that dirt intermingled with the blood…he’d have to closely monitor the coloration inside his nail. If it was still tender in a few days, then he may have to seek medical attention, he thought, and what if his doctor then told him his blood pressure was still too high? The pistachio munching would have been all for nothing. He searched some Google images of infected fingernails and the results repulsed him. He couldn’t focus on anything else. He told his supervisor he was coming down with something and took a sick day so he could go home a couple of hours early for the weekend. At home he couldn’t relax, just being aware of the mild throb and existence of a blood blister, there on the inside of his nail, made him fidgety and anxious. He went to a corner bar, unfortunately called “Nutz Inn.” He asked for well whiskey, neat, and guzzled two glasses as fast as he could guzzle straight alcohol, because around him, each table had a basket of peanuts, and crumbled peanut shells coated the floor. This was too much of a reminder of the culprit. He came here to forget! He left the bar and picked up his own bottle, Maker’s Mark, but forgot about the wax that sealed the cap. He had to peel it in shifts, stopping to cringe when the throb below the nail went beyond his pain tolerance. Phil punched his own chest. He soon got the wax off, and squealed with relief. He sank into the couch and drank straight from the bottle. He found a baseball game on TV and watched it until he saw a batter get beamed right on the hand. The angle of contact looked like it might even be the player’s thumbnail. He didn’t want to risk seeing any close-ups of the injury. He switched it off and dozed on the couch. When he woke up in the middle of the night, he was hungry. He was bit out of it, drunk still and groggy, and without thinking, he opened up the pantry and pulled down a bag of pistachios. As he grabbed a handful, the fuzzy memory of his ill-fated snack time surfaced, but he was also flush with whiskey bravery. He decided he would pop some in and use his teeth to crack the shells. Three went into his mouth. He maneuvered one in between his front teeth, with the shell’s slight opening lined up with his upper incisors, and bit down. The tight clamp of the shell didn’t budge. He re-situated the pistachio and bit down harder. A sharp pain burst in his gums and there was a sudden taste of blood. Something else hard joined the jumble in his mouth, a small kernel of bone, and his tongue confirmed a new gap where one of two front teeth should be. Phil cussed and flinched and dropped the contents of the pistachio bag all over the floor. He’d clean it up later, for now he had to research what to do about a lost tooth. Dental practices wouldn’t be open at that hour. Should he go to the ER? He spat the tooth into his hand, then the blood stained shells into the sink, and turned to get out of the small kitchen, to rush to the bathroom to see if he had any cotton swabs in the medicine cabinet. The ball of his foot landed on a couple of the rounded shells that now littered the floor. His balance wavered, his other foot shifted back, but landed on another cluster of pistachios on the linoleum. The back of his skull slammed into the metal rim of the stove. Quick stars, then dimness. He lay, unconscious, on the floor, with pistachio shells pressed into his skin. It’s no wonder for twelve straight hours he endured concussion dreams. 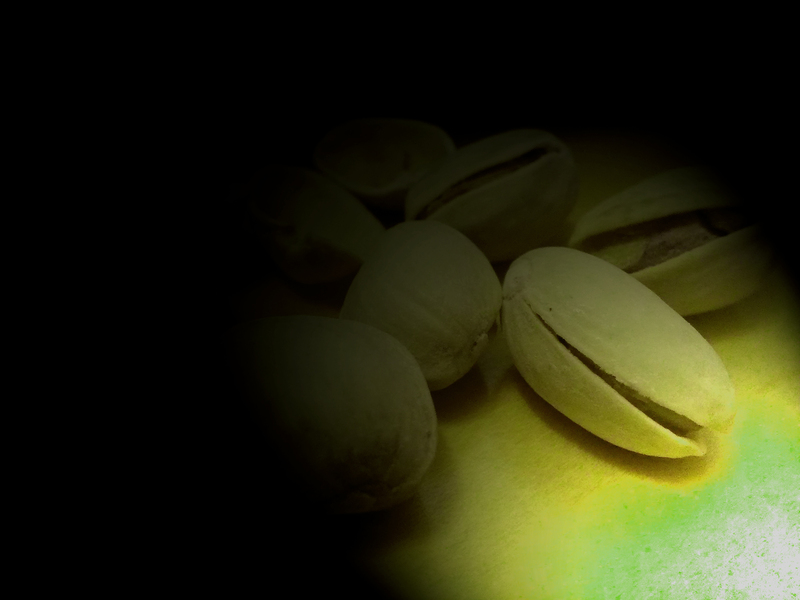 Pistachios were cast as giant mutants, with deep hunger growls echoing from within the acoustics of a large, hard body. The pistachios operated as pack hunters. His torso was milliseconds from being snipped in half by the powerful bite of a pistachio mouth, when he was awakened by the building’s maintenance man kicking aside some shells so he could help up Phil Brecker in unit 403 and inquire about which window in the bedroom, as previously reported, wouldn’t open. Previous postDrinking and Morality in New Orleans.